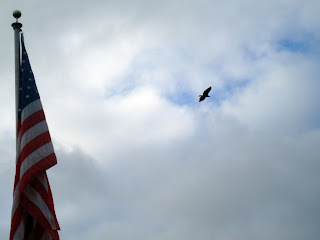 On my noon walk yesterday two bald eagles flew directly over my head only about 15-20 feet up! They were being chased by crows. I couldn’t get my camera out of my pocket in time to get their picture. However, on the return leg of my walk I heard what definitely was an eagle cry, pulled my camera out, looked up, snapped a picture, and believe it or not, this is what I got! Talk about patriotic! 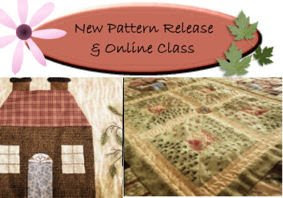 Lenna over at the Stitching Cow is having a terrific giveaway to showcase her new pattern release and online BOM class! If you mention her giveaway on your blog, you will be entered in a drawing for the entire class and materials! 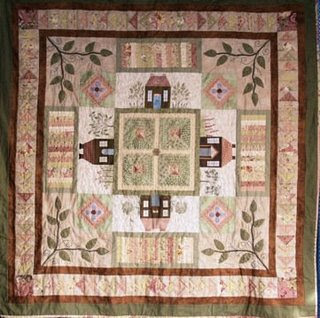 The quilt, seen below, combines several techniques and is certain to be an heirloom! You can go here for more details about the quilt and the program. ****UPDATE: Apparently I misunderstood what was included in Lenna's giveaway - I'm SO sorry, Lenna! What is included is the entire online class for this project including e-patterns and instructional videos but does not include materials. Thanks for setting me straight on that, Lenna! AWESOME shot! I don't think you could have planned it better than that! Thanks for including my BOM graphic on your blog. I have entered you in the competition and wish you the best of luck. I just want to clarify that the competition prize is to win the entire online class for this project including e-patterns and instructional videos but does not include materials. Yes, that's a fantastic photo. What timing! Hmmm, now that's an election year shot for sure-lol.